AP recently reported: “Connecticut’s Supreme Court has rejected a claim by a coalition of municipalities, parents and students that the state’s educational funding formula is unconstitutional. 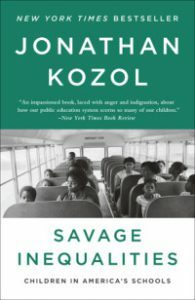 Available for a limited number of interviews, Kozol has worked with children in inner-city schools for nearly 50 years and has authored several books that have won numerous awards, including: Savage Inequalities: Children in America’s Schools, The Shame of the Nation: The Restoration of Apartheid Schooling in America and Amazing Grace: The Lives of Children and the Conscience of a Nation. He said today: “Amazing! A high court in Connecticut sees no obligation to equalize school funding between poor and wealthy districts in that historically unequal state. Instead of giving poor black and Latino kids in impoverished cities such as Bridgeport an equal shot at education and a decent and rewarding life, the state simply piles on more testing and insists that kids be held ‘accountable’ if they cannot do as well as their peers in super-wealthy Darien and Greenwich. “This is a disturbing pattern everywhere in the United States today. Don’t give poor kids the most experienced and best compensated teachers. Don’t give them small classes or the three full years of preschool that the children of the privileged enjoy. Don’t even dream of ending the virtually total segregation to which the state and nation have returned. Then hold them all accountable, not for their sins, but for ours.